History was made and justice done on a number of fronts Sunday night. Not that deserving people didn't leave the 74th annual Academy Awards empty-handed. 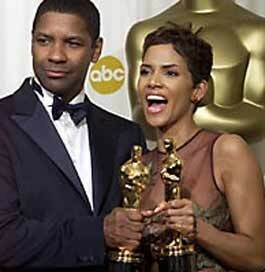 As everyone knows by now, though, both Best Actor and Best Actress Oscars were won by African-Americans for the first time. In fact, Halle Berry is the first black actress to win for work in a leading role, period Ñ in this case, for Monster's Ball. Denzel Washington was only the second black actor to do so Ñ for Training Day. Serendipitously, the first happened to be on hand to collect a lifetime achievement honor. It was a highlight of the evening when Washington and Sidney Poitier saluted one another across the Kodak Theatre. "Forty years I've been chasing Sidney," Washington joked. "They finally give it to me and they give it to him the same night!" it's for every nameless, faceless woman of color who now has a chance because this door tonight has been opened." Other triumphs long overdue included a Best Song win for Randy Newman for his Monsters, Inc. ditty, "If I Didn't Have You." "I don't want your pity," he cracked on accepting the award, the 16th for which he'd been nominated in his distinguished career. The composer went on to thank the music branch of the Academy for "so many chances to be humiliated over the years." Host Whoopi Goldberg should have been so cheeky. Opie finally struck gold, too. A Beautiful Mind earned Tinseltown's nicest guy Ñ Ron Howard Ñ Best Director and Best Picture awards, not to mention the respect which inexplicably has eluded him throughout his accomplished directing career. And it was nice to see Woody Allen getting along with the grown-ups. He did a classic bit of stand-up. Acknowledging the crowd's ovation as well as the heightened security, Allen quipped, "Thanks very much. That makes up for the strip search." He then introduced a Nora Ephron-created pastiche of classic films shot in New York City, opening with Allen's own Manhattan. It was a nice touch. As was the portion of the ceremony devoted to Robert Red-ford's Lifetime Achievement Award, though one got the distinct impression he wanted to make the point that neither his achievement nor his lifetime were quite a done deal yet. Academy, ever hear of a little festival called Sundance? More from the nice surprise file: rumors of Ryan O'Neal's imminent expiration appear to be exaggerated. The actor looked pretty fit to me as he joined Ali MacGraw to present their Love Story director, Arthur Hiller, with a special humanitarian award. The wonderful and all-too-overlooked Jim Broadbent appeared to be as shocked as everyone else when his name was announced in the Best Supporting Actor category Ñ for Iris. George Harrison's inclusion as part of the show's yearly "In Memoriam" tribute was classy, I thought. It would have been easy for the Academy to overlook the late Beatle's second career as a film producer. And talk about history making: Not only did Barbara Walters fail to make any of her three pre-show interview subjects weep, a couple of them Ñ Sarah Jessica Parker and Halle Berry Ñ even chided her for trying. Now that's entertainment. Let's face it though, Russell Crowe's got to be walking around asking himself what more an actor's supposed to do to win another one of these deals. His performance in A Beautiful Mind was the best thing about the picture, and he's practically the only one associated with it who didn't go home with an Oscar. Maybe the Academy should have made like Olympic judges and given out a second first prize. And Jennifer Connelly? Come on. In what possible way was she the Best Supporting Actress in a film this year? For my money, Marisa Tomei did infinitely more interesting work in In the Bedroom. High on the list of things we probably could have lived without: that goofball backstage news-desk set-up, from which "anchors" Donald Sutherland and Glenn Close performed cohost chores like handling the transition to commercial breaks. And gaily colored members of Cirque du Soleil running around and striking fanciful poses all over the place. Not to mention the show's record-shattering running time of four hours and 23 minutes. I say we bag the pre-show fashion chat, along with the Barbara Walters special, and just get this party started earlier. I don't know about Whoopi Goldberg, but I've got to get up early in the morning. The scandal of the 2002 Oscars has to be the snubbing of Baz Luhrmann, director of Moulin Rouge. Somehow the groundbreaking musical was good enough to merit a Best Picture nomination, but Luhrmann wasn't a good enough filmmaker to merit a Best Director nomination for making it? Lord of the Rings was a more daring, original and visionary movie? Black Hawk Down? I don't think so. But their directors got nominated. It's this kind of high-powered thinking that allowed 40 years to pass between Sidney and Denzel. The Academy made up some important ground Sunday night, but it still has a long way to go.